Skilled and Technical Sciences Education prepares students for employment and/or continuing education opportunities in skilled trades and other technical occupations, as well as promoting quality programs based on recognized industry standards. The major industrial areas of Skilled and Technical Sciences are construction, manufacturing, transportation, communication, personal services, and protective services. People who work in technical fields are found everywhere. Our vision is to see that every student receives the academic knowledge, technical skills and dispositions needed to be successful in the career of his or her choice. Students will develop essential career preparation skills through technical and experiential education, as well as personal leadership opportunities. 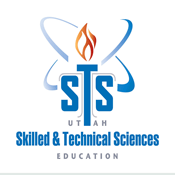 For more information on careers in the area of Skilled and Technical Sciences, please visit UtahFutures. SkillsUSA is an extracurricular organization made up of students, teachers and industry representatives working together to ensure America has a skilled workforce. SkillsUSA empowers its members to become world-class workers, leaders and responsible American citizens. SkillsUSA improves the quality of our nation’s future skilled workforce through the development of personal, workplace and technical skills grounded in academics.